One of the most beautiful creations God made and one of my favorite is the butterfly. Butterflies are free. I researched caterpillars and butterflies today. It was fascinating to read about them. Caterpillars are one big munching machine from the time they are born until the time they are transformed into the butterfly. They even eat their own skin in the chrysalis! Butterflies are more graceful and delicate. Their favorite beverage is a flower drink (the nectar). Butterflies are all about flight and reproduction. Even when resting, butterflies are often preparing for flight by keeping their wing muscles warm enough to move. Butterflies also have an extremely short life span. The small blue butterfly can live only a few days. The migrating monarch butterfly can live up to 12 months. Some species of butterflies migrate thousands of miles or hibernate in the winter. But at the end of their journey or at the beginning of spring, all butterflies’ actions are the same. They mate, the females lay eggs, and then all the adults die. The eggs hatch into caterpillars, which turn into similarly short-lived butterflies. Born to freely fly. Born to multiply. It’s the same with us as Christian believers. We weren’t made to just munch, munch, munch our way through life – consuming everything the world offers such as material goods, entertainment, social media, food. We were created for so much more – to fly with God. To fulfill His purpose for our lives. To be fruitful and multiply on earth, to subdue it and rule over everything. (Genesis 1:28) To leave a Godly legacy through our children. We are to be Freed by His Love, Transformed by His Power. Are you free? Do you want a change in 2013? Be one of the 50 women who will experience transformation this spring! 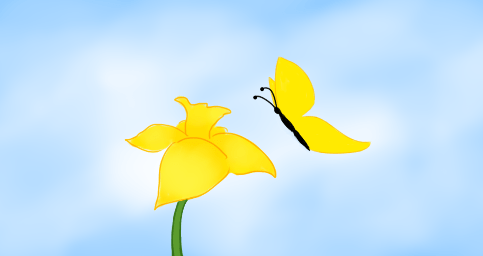 A yellow butterfly is the logo for our RELEASED! Women’s Conference on April 27 in Belton, MO. Click here to save your seat! You can also register online through Event Brite. This gives you more payment options to attend. Click here to get your ticket through Event Brite.